OC Mom Activities: Marie Callender's Lasagna is Nutritious, Delicious and SO Easy! Marie Callender's Lasagna is Nutritious, Delicious and SO Easy! Being a mom and working full time is tough. I'm very fortunate to be able to work from home full time, but it doesn't really change how hard it is to keep on top of everything. One of my weaknesses is dinners. I've found that I have to plan out the meals for the week ahead of time (I normally do my weekly grocery shops on Sundays). If I don't, I find that we are spending a lot more money on take out and getting a lot less nutritious meals. But after a long day of work, I'm frequently running out of steam and brain power to get something organized. If I don't already have dinner planned out I'm embarrassed to admit I fall back on take-out. 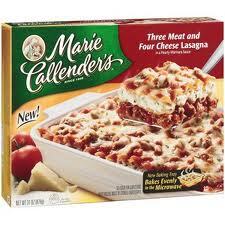 I recently had the chance to try out the Marie Callender's frozen lasagna. Oh my goodness, it was beyond delicious. We tried the Three Meat Four Cheese Lasagna. The kids loved it and it was the perfect size four our family. Reading the ingredients was refreshing - I could pronounce everything and was very impressed with the use of real and fresh ingredients. There wasn't anything in the ingredients that made me cringe! Every single ingredient was something I was happy to feed my family and I can't tell you how comforting that is as a mom. I have a lot of guilt about the meals sometimes! But this was definitely a frozen dinner that was very close to one I would have made on my own and it takes far less time. A huge bonus is that it is very affordable and actually cooks a lot faster than the other frozen lasagnas I have bought in the past (this one only took 60 minutes in the oven). Reading the nutrient content was also fun - I was thrilled to see so many vitamins and other nutrients in the lasagna - making it clear that real ingredients were used. I paired it with a fresh baked loaf of bread (I suggest a par baked or one of the other varieties). I baked it alongside the lasagna. I was out gardening while the nutritious and delicious dinner cooked. Love that! Keeping several of the Marie Callender's family sized frozen entrees in the freezer is going to be a must in our house for those nights when I realize I don't have a dinner planned for the night and I just don't have the energy to cook after a long day! 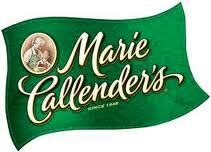 *Note: This is a part of a compensated campaign through TheMotherhood and Marie Callender's. But note that the opinions are 100% honest and this is definitely a product I will happily be purchasing again for my family.